I never had homemade soup growing up so when I was a kid, we ate turkey leftovers for days and days after Thanksgiving and Christmas. My husband's family did make homemade soup so for him, a leftover turkey means you should make soup. I have tried a few different recipes and I never found one that I liked very much before this Southwest Turkey Soup. This is a really easy soup to make. You will need to make some turkey broth before you start this soup which is really to do if you've never done it before. I make it in the Crock Pot the day before Thanksgiving so I have enough stock for my Corn Bread Dressing, gravy, and this amazing soup. 2. Add broth and bring to a boil. Reduce the heat to low and simmer for 10 minutes. 4. Add the flour, salt, chili powder, and cumin to a medium sized bowl. Slowly whisk in milk until the mixture is smooth. 5. Increase the heat to high and slowly add the milk mixture to the soup. Stir until the soup is thick and bubbly. 6. Add turkey, corn, cilantro, and cheese and cook for 5-10 minutes. 7. Ladle into bowls and top with cilantro. I hope you like this soup as much as we do! Um.. hello! This looks super tasty! I bet you could also use chicken! I grew up eating canned soups, but have started to try to make more soup from scratch lately. This looks yummy! I'm always on the lookout for good recipes to help use up Thanksgiving leftovers. I pinned this one so I won't forget. 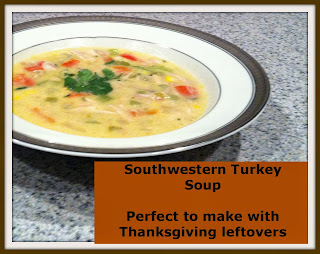 I love all of the things that you can do with Thanksgiving leftovers, I plan on giving this one a try. Thank you for sharing at Fluster's Creative Muster. Now that you found our party I hope that you'll continue to join us every Tuesday evening.